In what is described as a historic gathering in Sri Aman this weekend, Iban Christians urge reconciliation with Putrajaya over the 'Allah' crisis. They urged the federal government to resolve the crisis by entering into consent judgment with the church for the three cases pending before the courts. "Today, we are gathered here in Bandar Sri Aman, a town whose very name means peace. This is indeed an historic assembly. History will surely judge us by what we say and do from today henceforth. We are on a prophetic threshold as children of God. "We must be reminded of our cultural heritage as Christians that it is neither accident nor coincidence that Sarawak is the only Christian majority state in the country. “Our status is one of divine appointment. 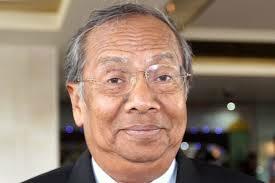 It is not surprising then that Sarawak is known as the Bible belt of Malaysia." The archbishop pointed out the fact that the church in the state has not for once demanded that the chief minister's post or that of the governor be picked from among Christians bears testimony to the extent the church is willing to go for the sake of reconciliation and peacemaking. "We have and are doing our part in reconciliation. We feel that it is incumbent on the federal government to recognise our cultural heritage and our constitutional rights to practise our faith without undue interference and intervention." "It has not been easy for us. But because by the grace of God we are defined as family with a call to action in reconciliation, we have been more than willing to find not only the call but also the means of being reconcilers, when our instincts and passions often lead us in the opposite direction. We have gone the extra mile for the sake of reconciliation." "This is half-baked theology if turning the other cheek is tantamount to sending a wrong message to the provocateurs and extremists in political Islam that we are willing to abandon our calling to being peacemakers and reconcilers. The extremists, he said, are a tyranny by the minority while the rest including peace-loving Muslims and non-Muslims, have been sucked into the spiral of silence only to become the suffering majority. "To turn the other cheek in these circumstances is indeed to bear false witness to the Gospel of reconciliation itself. This we will not do," he said. Ultimately, he added, it is for all Malaysians of goodwill to ensure that Malaysia is not hijacked by the deluded minority. The archbishop also lashed out the judiciary by saying that "the insanity that we are facing has become so systemic that even the judiciary has seen it fit to abandon sound principles of jurisprudence and taken an unprecedented extra-judicial position that the use of the word 'Allah' to refer to God is not an integral part of the faith and practice of Christianity. This is an uncalled for, unnecessary and a gross insensitive provocation." He concluded by urging the federal government to revert to the status quo by entering into consent judgments for the three cases still before the courts related to the use of the prohibited word. The gathering signals the launch of a new movement known as Gempuru Besai Gerija Anglika Jaku Iban or the Great Gathering of the Iban Anglican Church. The term itself is full of political significance for Ibans. The first Gempuru Besai was in Kapit in the mid-section of the Batang Rejang, the longest river in Sarawak. It was here that the gathering of Iban chiefs lay down what is known as the 18-points to the Cobbold Commission as non-negotiable conditions for entering into the Malaysia Agreement for the formation of Malaysia in 1963. The first of these conditions, like their counterparts in Sabah, is for complete freedom of religion in the two Borneo states. The Sri Aman Gempuru Besai comes three months after the Gempuru Besai Raban Kristian Jaku Iban Malaysia (Gbkjim) which was held in Kuching where the police allegedly removed 'Allah' banners from the conference site. The Gbkjim is a separate Christian body which was started 14 years ago but has increasingly become high profile over the 'Allah' controversy. The Gempuru has also a knock-on effect in Sabah where a new Christian NGO Perpaduan Anak Negeri (PAN) Sabah or Native Solidarity has launched a six-month awareness campaign known as Mamangkis, a contextualised Christian version of an old native war ritual. The birth of PAN is in the main due to the frustration among lay native Christians over the reluctance of the institutional church in Sabah to play hardball with Putrajaya over the 'Allah' issue as well as conversion to Islam by dubious means. Many have come to Sri Aman this weekend with high expectations from the archbishop. There are even loud whispers to reviving the spirit of Rentap, the legendary Iban warrior who took on the might of the White Rajahs single-handedly when, both out-gunned and out-numbered. The ruins of Fort Alice near the conference site in Sri Aman where Rentap made his last stand is reminder enough to stir brave hearts. Archbishop Bolly Lapok is a native Iban and currently the Metropolitan Archbishop and Primate of the Anglican Church of the Province of Southeast Asia as well as the Bishop of Kuching. Ordained in 1975, he has been the chairperson of the Association of Churches in Sarawak since 2009. GIDEON LEONG is the non de plume of the writer, who is a religion researcher. KUCHING (March 27): Three Bars of Malaysia have strongly condemned Sarawak government’s unconstitutional move to deny politicians from the opposition entry in the state. The three Bars of Malaysia – Advocates’ Association of Sarawak, Sabah Law Association and the Malaysian Bar, in a joint statement today, urged the state government to immediately reconsider the entry ban. “We call on the Sarawak state government to immediately reconsider the entry ban that it has imposed, and to cease and desist from resorting to such action unless with a justifiable cause," said the statement, which was issued by Advocates' Association of Sarawak president Khairil Azmi Mohd Hasbie, Sabah Law Association G B B Nandy @ Ganesh and Malaysia Bar President Christopher Leong. Further, the three Bars of Malaysia also urged both the state and federal governments to take positive steps to safeguard each citizen’s right to travel freely and peacefully within his or her own country. On Tuesday, three PKR leaders - PKR strategist Rafizi Ramli, vice president Tian Chua and secretary-general Saifuddin Nasution were stopped when they arrived at Sibu airport. PKR de facto leader Datuk Seri Anwar Ibrahim was allowed in but the chief minister Tan Sri Adenan Satem said the state could kick him out if “he tried to be naughty”. Today, PKR wanita chief and Ampang MP Zuraida Kamaruddin was stopped at Sibu Airport upon her arrival at around 2.30pm. Notwithstanding the special safeguards accorded to Sarawak under the Federal Constitution, the three Bars of Malaysia strongly urged the Sarawak government to exercise sparingly, fairly and with just cause the statutory powers it has over immigration and border controls. Section 67 of the Immigration Act 1959/63 makes it clear that the State’s powers to restrict entry shall not have effect on a citizen who can show that he or she enters the state for the sole purpose of engaging in legitimate political activity. “In a country that professes democracy and free elections, such powers to restrict must not be used to obstruct the rights of citizens to participate freely and legally in the country’s public affairs,” read the statement. The amount of funds announced for Balingian during the campaign exceeds the total sum spent on the constituency in the last five decades, claims PKR. MUKAH: The number of projects and upgradings announced for Balingian since March 17 has left opposition PKR reeling in shock. The Balingian by-election which will be held tomorrow is now literally a “buy” their loyalties polls, which is surprising considering the seat has been a Barisan Nasional stronghold since 2001 when former chief minister Taib Mahmud won the seat. 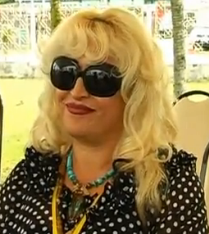 In the 2011 state election Taib retained the seat by 5,154 votes. In the earlier 2006 polls he locked in a majority of 5,726 votes. Opposition PKR which is fielding Bintulu businessman Abdul Jalil Bujang is hoping to eat into BN’s previous majority. But BN, through its candidate former Dalat district officer Yussibnosh Balo, is aiming for a landslide victory. Various state and federal BN leaders have been making their rounds in Balingian wooing and cajoling voters with declarations that a big victory will be a show of gratitude to Taib and an endorsement of his succesor Adenan Satem’s administration. Balingian falls in Sarawak’s ‘industrial’ zone. Taib’s pet project Sarawak Corridor for Renewable Energy (Score) is sited in the Mukah parliamentary constituency where Balingian sits. An overwhelming win will also stamp BN’s continued control in the rural interior which has been facing active assault by opposition DAP and PKR since the the 2011 state election. Both parties saw unprecedented victories in the 2011 state elections. DAP won 13 seats, albiet in the urban areas. PKR took three seats, losing at least two constituency by a hairline. Perhaps this is the reason why BN is aiming its money muscle in victory-guaranteed Balingian. According to state PKR vice chairman See Chee How the millions being thrown around in Balingian since the March 17 nomination, was unprecedented and “more than the constituency has seen in decades”. The latest being a pledge by Sarawak’s Infrastructure and Communication Minister Michael Manyin to build a 11-kilometre missing link road between Kuala Serumpai and Kuala Tatau at a cost of RM230 million. The numbers shocked See, who said that on the average one kilometre stretch of road in Sarawak would cost between RM1 to RM1.5 million to build. He questioned the need for RM230 million for 11 km road stretch, adding that it reflected the need for a better check and balance system against the ruling government and that BN was fearful of their weakening strength in Balingian. “The extravagance is shocking. We want people to know that the BN government has made so many promises in the Balingian by-election because of PKR’s strong presence. “This has shown how important it is to have a dual party system. We need a good check and balance of the government. “We urge all voters to come to vote on March 29,” said See alluding to the Kajang by-election which saw a low voter turnout. Nonetheless PKR retained the Kajang seat. Now it is Ampang MP Zuraida Kamaruddin (pic) who has been denied entry into Sarawak, making her the fourth PKR leader from the peninsula to be barred from the state in as many days. The PKR Wanita chief, who arrived in Sibu at 2.30pm on an AirAsia flight, was, like three of her party colleagues before her, told on arrival by immigration officers that she was barred from entering the state. She will be put on the next flight back to Kuala Lumpur. On Tuesday, immigration officers had stopped PKR strategic director Rafizi Ramli, member of Parliament Tian Chua and their secretary-general Datuk Saifuddin Nasution Ismail at Sibu airport and told them they were not allowed to enter the state. 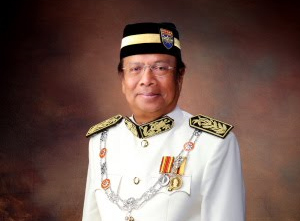 PKR leaders are now wondering if Selangor Menteri Besar Tan Sri Khalid Ibrahim, who will be flying in later this evening, would also be denied entry into Sarawak. Rafizi and Chua, who flew to Sarawak together with PKR de facto leader Datuk Seri Anwar Ibrahim, were told by immigration officers that their names were in the list of people barred from entering the state. Anwar, however, was allowed in. Earlier on Tuesday morning, Saifuddin was stopped at the Sibu airport and informed he was barred from entering the state. All three were put on the next flight back to Kuala Lumpur. PKR has reacted angrily to the barring of its national leaders from the by-election with its Sarawak deputy chairman See Chee How saying it was an abusive and misuse of the government's power on the immigration autonomy. In a text message, See said he was disappointed with Sarawak Chief Minister Tan Sri Adenan Satem whom he accused as going back on his words not to bar opposition politicians from the state. 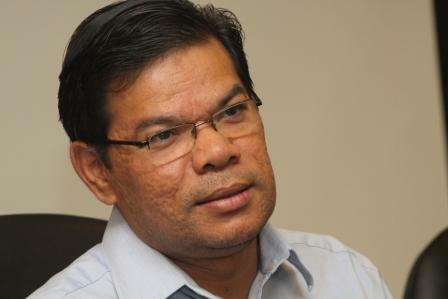 Political analyst Dr Mohd Faisal Syam Abdol Hazis has suggested that the “sums game”, or the need to win by a big a majority, is why Adenan barred the PKR national leaders from entering the state to campaign for the by-election as they could make a difference to the result. “There's no valid reason to bar the PKR leaders unless Adenan and the state Barisan Nasional (BN) believe they could take the shine off a BN victory. “This is a safe seat. For the new chief minister, I believe he wants to put his stamp on Sarawak politics in the best possible way. "Win by as big a majority as possible. Stamping that mark starts in Balingian,” Faisal said. – March 27, 2014. Sarawak Report can demonstrate that the statement by the Immigration Department that the Perkasa leader, Ibrahim Ali did not visit Sarawak last week is untrue. Allowed into Sarawak – Perkasa’s Ibrahim Ali last week spent several hours here in the Restaurant of the Harbour View Hotel on the night of March . Meanwhile legitimate PKR opposition politicians were banned. 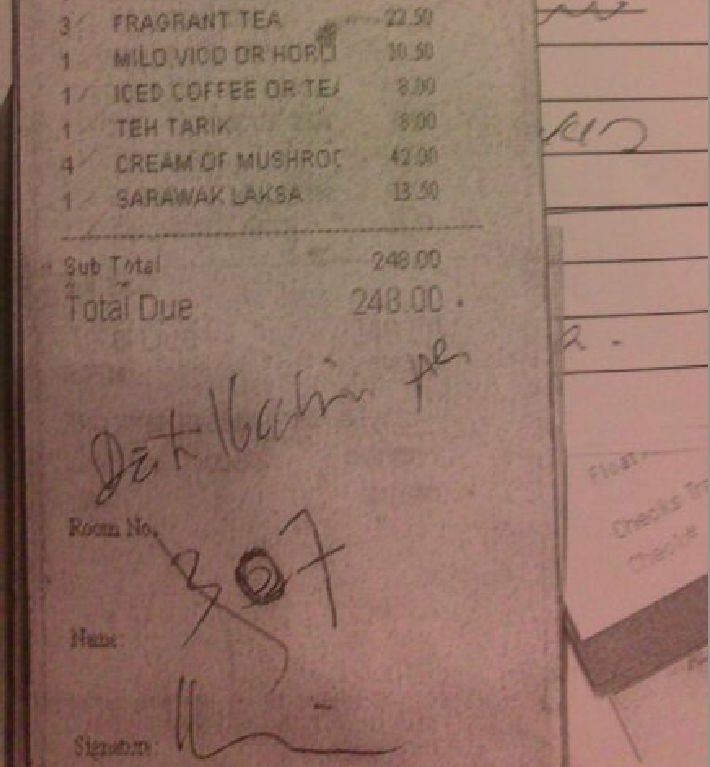 We have the proof of Ibrahim Ali’s own hand that he was indeed in Sarawak, because he personally signed for drinks and snacks at the Harbour View Hotel in Kuching, where he stayed for two nights in Room 307. We can confirm that the visit to Kuching last week was arranged under the name of the Malay supremacist group (which calls itself an NGO) by its its Secretary General, Syed Hassan Syed Ali. Syed Ali booked four rooms under the name of Perkasa at the Harbour View, which costs approximately RM150 a night, for the nights of the 20th and 21st of March. We have copies of those registrations. 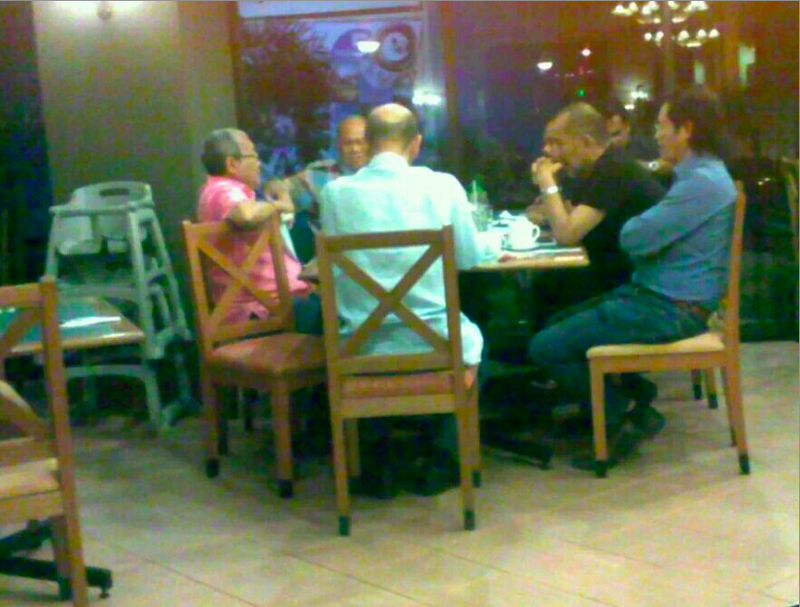 The group then spent several hours drinking and talking till midnight in the hotel restaurant area with members of the group PKMS – Persatuan Kebangsaan Melayu Sarawak (National Association of Sarawak Malays), who reportedly invited the right-wing extremist Perkasa group over to address their organisation. Following outrage over the visit and reports that the Perkasa leader is preparing to launch a new chapter of his notorious, right-wing ‘hate organsation’ in Sarawak the state Immigration Department yesterday issued a stout denial that he had visited the state. This misinformation has apparently been backed up by police and special branch and was reported in the local press. 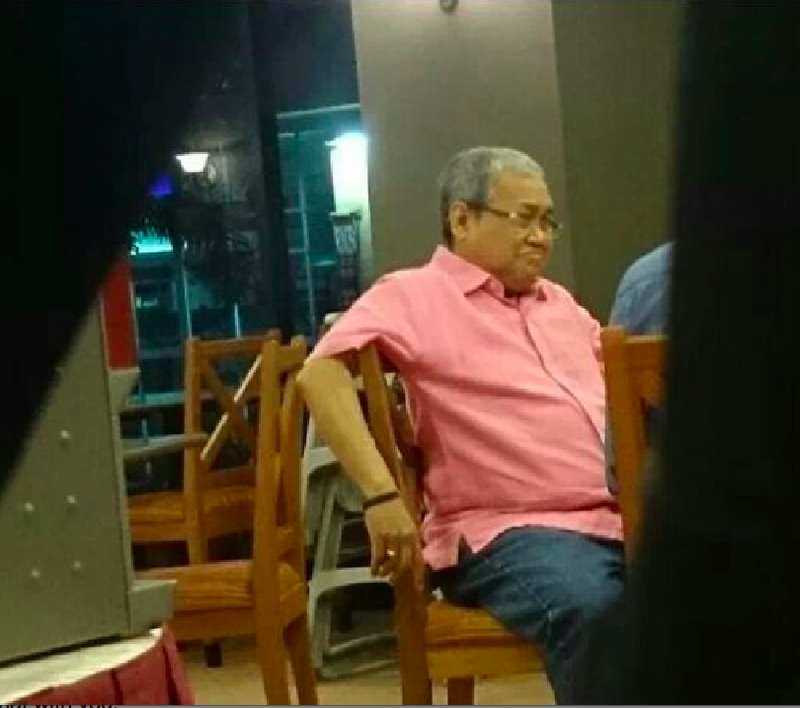 However, we can demonstrate that a carbon copy Ibrahim Ali look-alike was not only sitting in the Harbour View Hotel with Perkasa colleagues on Friday night, but he signed the bill in his own name, proudly using his title Dato’ Ibrahim Ali and citing the number of his room 307 (left). 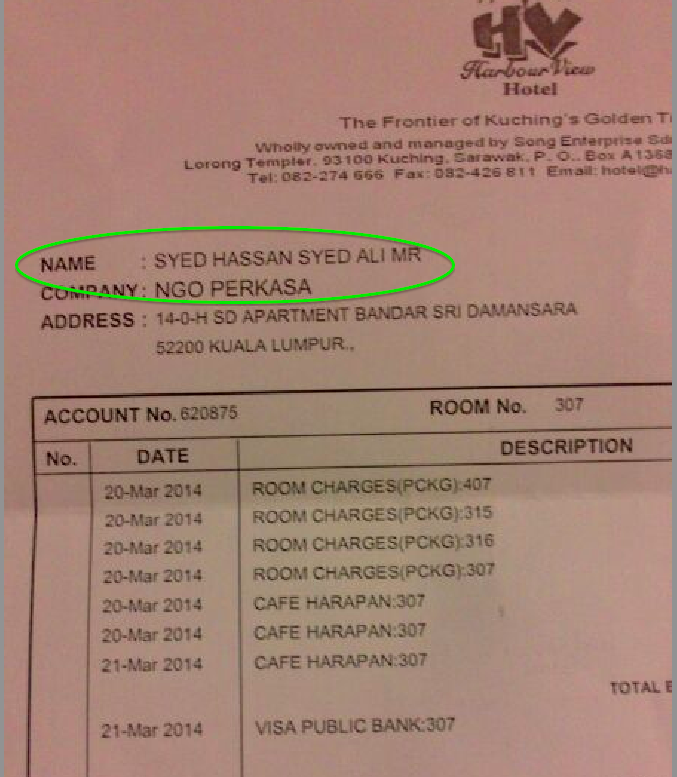 We also have a copy of his hotel booking which was made out in the name of Perkasa and its Secretary General Syed Hassan Syed Ali. So, either the entire visit was an extraordinary stunt, complete with false press statements and a highly convincing Ibrahim Ali celebrity look-alike, who signed in his name, or the Sarawak authorities are beginning to look like foolish disseminators of false information. The extremist agitator Ibrahim Ali’s unwanted visit to the state could not have come at a more provocative time, given the extraordinary actions of the state government this week in barring legitimate opposition figures from entering Sarawak. The order to the immigration authorities represents a blatant attempt by the ruling PBB/BN state government to prevent PKR from legally campaigning in the Balingian by-election. Yesterday, three senior members of PKR Rafizi Ramli, Tian Chua and Saifudden Nasution were all turned away when they arrived from West Malaysia and it has emerged that in all 8 members of PKR, which is fighting the Balingian seat on behalf of the PR opposition alliance, have been blacklisted from Sarawak. It is a classic abuse of internal border controls by the tin pot dictator, Taib Mahmud, who has regularly banned anyone who he fears might criticise, expose or challenge his stranglehold over Sarawak. The editor of this blog is likewise barred, along with many others, from legitimately entering the state. Not only does this mass banishment make a laughing stock of the supposedly ‘democratic’ by-election taking place in Taib’s former state assembly seat in Balingian, it also exposes shocking hypocrisy, given the opposite treatment of the highly provocative extremist Malay supremacist, Ibrahim Ali. “As a responsible government, we will invoke the immigration power given to us by the Federal Constitution to prevent outsiders who are known to be religious bigots, communal racists and trouble-makers from coming into territory or to deport them if they are already in Sarawak. 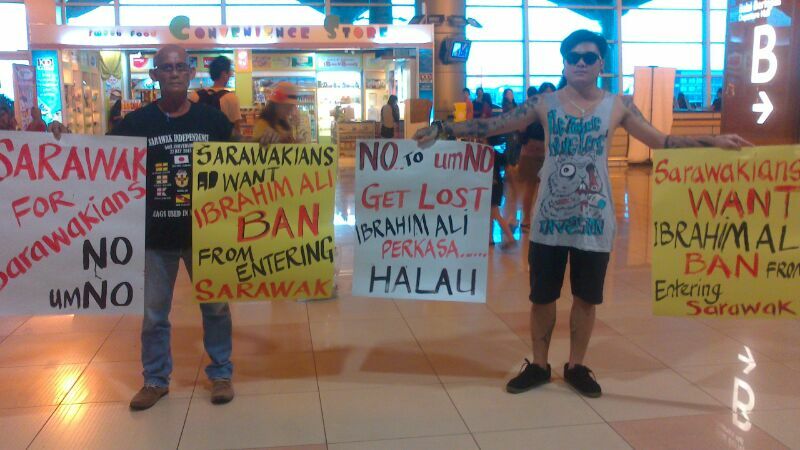 “This is to prevent peaceful Sarawakians from being infected by racism and religious bigotry. This is done only in the best interest of the peaceful people of Sarawak, who are known to be hospitable and moderate in their views and actions.” Satem told a bemused audience on the Balingian campaign trail. Yet it has turned out that it is regular politicians who have been prevented from spreading their peaceful messages, while it is a racist and divisive Malay bigot who has been allowed in and permitted to start organising a base in the state. Satem – Taib puppet and UMNO catspaw? Perhaps it is time that more people in Sarawak understood the lie and realised that Taib and PBB have not kept UMNO out of the state, which is Adenan Satem’s favourite message of this election? Instead, his party has for all these years acted as UMNO’s active agent in the state, milking Sarawak’s resources for the benefit of West Malaysia’s ruling party and themselves. And now that the BN/UMNO government has admitted that it is funding Perkasa to threaten its opponents it appears Satem too is allowing this outfit to set up in Sarawak. So far, Adenan Satem has not had the courage to go the whole way and ban the PKR leader Anwar Ibrahim as well, as was widely anticipated, evidently because of the world attention this would undoubtedly receive. Creating trouble, of course, means upsetting BN’s stranglehold of Sarawak and like all rural elections in Sarawak, this Balingian by-election is phoney. Indeed, Malaysia BN party is now the world’s oldest ‘democratic’ regime, thanks to seats delivered from the rural regions of Sarawak and PBB will spend the 14 days of the paltry ‘campaign’ period abusing the resources and administration of the state to force through its own victory. Likewise, the refusal to allow the opposition to even present their case in Balingian is all about showing voters ‘who is boss’ and Satem issued threats from the start, informing voters they would be ‘cursed’ if they did not show ‘gratitude’ to Taib Mahmud by voting PBB. PBB will follow up this ‘show of power’ in coming days by tossing a few meagre ringgit around the village communities and a nice bonus to their salaried headmen, in order to confirm the message they want to convey, which is that “PBB/BN is the boss, so don’t mess with us”. This has nothing to do with democracy, because in a democracy the people are the boss. Therefore Sarawak is not a democracy. Balingian is voting in this by-election for a candidate who will sit 16 days a year in the State Assembly. Taib has turned this ‘elected’ body into a farce by reducing its days of operation to two sessions of just 8 days each, most of which are occupied by the opening and closing ceremonies. Any assemblyman who asks a proper question, for example about why the majority of the state budget is now secret, is simply removed from the chamber by Taib’s strongmen. In return for the loss of their representative powers Taib last year kindly trebled the salaries of these cardboard cut-out parliamentarians, who have all agreed to wear uniforms as if they were obedient soldiers rather than independent politicians. Having silenced the politicians Taib has also silenced the media by the simple method of making it illegal to print, broadcast or join a club or political party without a licence. No one who is not authorised by Taib can get that licence, which is why not only this blog, but also our sister radio station Radio Free Sarawak are treated as if they were ‘illegal’ in the State of Sarawak. However, against the standards of international law it is PBB, the State of Sarawak, its Governor and this phoney election that are illegal and the Malaysian Government should be enforcing the legitimate rights of free citizens and their political representatives in the state and not secretly subsidising the likes of extremist groups like Perkasa to enter Sarawak to cause even more trouble for its people. In a press statement, Perak DAP state assemblyperson Howard Lee Chuan How has questioned whether "hidden hands" were zealously preventing crowds from attending Pakatan rallies in Mukah. However he claimed that PKR candidate Abdul Jalil Bujang has reaped positive response, despite the stacked odds in Balingian. "The road ahead may not be very long, but it definitely is hard. But I, along with our Pakatan comrades will press on; brick by brick, block by block, calloused hand by calloused hand to deny the BN hegemony," Lee said of his experience after visiting Mukah this week. Balingian has been represented by ex-Sarawak Chief Minister Abdul Taib Mahmud since 2001 until he quit as CM after 33 years in power to become governor. PKR's Abdul Jalil is facing off against BN's Yussibnosh Balo on polling day set for Saturday. DAP's Lee noted that on one afternoon alone - PKR faced "a myriad of problems" to hold a rally at Boulevard Setia Raja, where PKR leader Anwar Ibrahim (right) was the anchor speaker. But Anwar was suddenly called to appear in the Federal Court the next day and therefore had to speak earlier than scheduled. Then the campaign team also discovered a "badly destroyed electrical transformer" which they suspected was meant to trigger a blackout. Meanwhile, a private contractor decided to suddenly carry out "fogging" activities right at the assembly spot. The fogging team agreed to stop after some negotiations. Lee claimed that no 14-day notice - the usual requirement - was given for the fogging the area for eateries. "This are the happenings in one afternoon of the twelve days of campaign, in one of the 21 voting districts in the constituency," Lee reported. He said that despite the obstacles, the ceramah had attracted a "never before seen crowd of over 2,000 Pakatan supporters." Earlier this week, at three PKR MPs - Rafizi Ramli (left), Saifuddin Nasution and Tian Chua - were stopped from entering Sarawak and deported upon arrival. Lee further claimed that gangsters tailed the Pakatan reps on their door-to-door campaign and used many other "undemocratic, uncivilised and un-Malaysian" ways to stop them from making inroads into the BN stronghold. The Balingian seat has 13,366 registered voters. In the last election, PKR’s candidate Suriati Abdullah obtained 871 votes against Taib, who secured 6,210 votes in a three-cornered fight. ANALYSIS As polling day for the Balingian by-election is two days away, both Barisan Nasional and Pakatan Rakyat are battling hard to win over the hearts and minds of the 13,366 voters. But greater attention is being focussed by both parties on the 3,875 Iban voters who are crucial to their victory. It appears that the Malay-Melanau voters of 7,705 are split between Christians and Muslims who are said to be unhappy that a Christian Melanau, Yussibnosh Balo is the BN-PBB candidate. They had put forward their recommendation of a Muslim candidate to Chief Minister Adenan Satem, but their recommendation was rejected in the eleventh hour. The Pakatan-PKR candidate is Abdul Jalil Bujang. Under an agreement in the Melanau community, the Balingian and Dalat state constituencies should be given to Muslim Melanau, while the Mukah parliamentary constituency should be contested by a Christian Melanau. But when the incumbent MP Leo Michael Toyad converted to Islam, the agreement became complicated. However, the Muslim community demands that Balingian should be given to them, hence the problem and the grumbling. Worried of the split in Malay/Melanau votes, the BN and Pakatan have focused their attention on 67 Iban longhouses which they believe is the key to victory in the by-election this Saturday. Even in the Iban sector, the BN has to work hard as it is worried that the Iban voters may be influenced by PKR’s exposure of 51 years of neglect resulting in the majority of the longhouses lacking basic amenities such as clean water, 24-hour supply of electricity, healthcare services, educational facilities and good roads, as well as lack employment opportunities. Another issue that frightens the BN is the allegation of land-grabbing which the opposition said was very rampant during the 13 years that the former chief minister Abdul Taib Mahmud represented them. Taib quit as their representative on Feb 28, 2014 which caused the by-election. Adding to the BN’s worry is the exploitation by PKR of a recent Sibu native customary rights (NCR) land court case where eight Ibans, representing several hundred Ibans from nine longhouses, were charged in court. They were charged with allegedly causing obstruction to a sand mining company from operating on their NCR land. “You will face the same land problems, and you will be arrested for defending your land if your land is taken away from you,” warned Sarawak PKR chief Baru Bian during his campaign trail in the longhouses. He said that he had filed three NCR land cases from Balingian, and another three more would be filed after the by-election. “A number of Tuai Rumahs (longhouse chiefs) in Balingian have come to me during this campaign asking my legal firm to sue the government as their land and the lands of their followers have been taken without their permission. “The only way is to solve your problems is vote the BN government out starting from this by-election, so that a new land policy under Pakatan government can be implemented,” said Baru, who is also the Ba’Kelalan assemblyperson. But the BN is serious in trying to stop PKR from having a “free hand” in the Iban longhouses, so Iban ministers led by Deputy Chief Minister Alfred Jabu (right) have literally been ‘camping’ in these longhouses to make sure that the Iban votes will go to the BN-PBB candidate instead of to the Pakatan-PKR candidate. When in the longhouses, the ministers were shocked to hear Iban voters bluntly telling them that they had been neglected and forgotten in terms of development - there are no basic amenities like clean water, electricity, healthcare services and educational facilities. They also complained of “mysterious illnesses” that had inflicted upon them allegedly due to emissions from the aluminium smelting plant which was built among their midst. The emissions from the plant and pollutants from upstream oil palm plantations have caused irreparable damage to environment that had also resulted in them losing incomes from the rivers as well from their gardens. Fish had disappeared, and their padi, vegetables and cash crops have been destroyed. Monthly they incur huge medical bills as a result of the mysterious illnesses. That is their main fear. Another issues brought before the ministers was the lack of employment opportunities given to Iban youths in oil palm plantations and in the smelting plant which preferred to give employments to cheap Indonesian workers. Nor were they given any opportunity to work with the government, even many of them have good qualifications. What should the Iban minsters do to solve their problems? In an effort to win back their hearts and minds, the Iban ministers promised more development and “election goodies”, and at the same time warned them not to listen to “sweet talk” from the opposition as they (opposition leaders) are trouble-makers. They also warned the voters that if they wanted “continued” development, they must vote for the BN candidate. Subtle threats are also used by BN campaigners like disturbing opposition’s political gatherings and sabotaging functions organised by the opposition. The case in point was Baru’s programme to one longhouse which had to be cancelled as Social Development Minister William Mawan and his entourage went to the longhouse at the same time. “Yes that is sabotage,” said Baru. What appears to be a desperate move by the government is the ban imposed on Pakatan leaders from entering Balingian. Chief Minister Adenan had already ordered three PKR leaders barred from campaigning in Balingian and has issued a stern warning to PKR de facto leader Anwar Ibrahim (centre in photo) to “behave” himself during the campaign otherwise he would be deported. But the ban can work to the advantage of the opposition if it can show that the government is really cruel and inhumane. The PKR by-election director, See Chee How, said that the strong presence of the opposition in Balingian has benefited the people of Balingian, and in the last two weeks the BN government has promised more than RM500 million worth of projects to be implemented in the constituency. “This amount of allocation announced by the federal and state governments is more than the total amount of money that the government had spent in the last 50 years. If the opposition is weak, the government would not be that generous. “But what are promised them may remain promises as the people are given ‘crossed cheques’. When can they cash the crossed cheques? “Perhaps, the people of Balingian will have to wait for the coming state election,” said See, who is also the state PKR vice-chairperson and the Batu Lintang assemblyperson. But the questions are: With all the promises of development, can the BN improve on Abdul Taib’s majority of 5,154 votes in the last state election and to make sure PKR lose its deposit again? Or can PKR improve on its 871 votes? World Bank economist Frederico Gil Sander says Malaysia's poor education system more worrying than household debt. – March 25, 2014.The poor quality of Malaysia's education system is more worrying than the level of debt in its households, said a World Bank senior economist in Kuala Lumpur today. This is because the country's substandard education system would affect the pool of skilled talent it needs to grow its economy to become a highincome nation, while high household debt is not necessarily a problem if the economy continues to grow and citizens are gainfully employed. Dr Frederico Gil Sander, who is senior economist for Malaysia, said Malaysians should be "alarmed" that their children were doing worse in school than children in Vietnam, a country that is poorer than Malaysia. Sander was referring to a world student performance assessment test called PISA which had measured how students in 65 countries did in mathematics, science and reading. According to PISA's 2012 results Malaysian students scored below average or ranked 52 out 65. In contrast, Vietnamese students ranked 17 out of 65. "Rural Vietnamese students do better than Malaysian students," said Sander, when met a forum that is part of the Global Malaysia series organised by the Economic Transformation Programme. Malaysia's poor PISA results spotlighted the weakness of Malaysia's school system, despite the fact that education gets the largest share of funds every year from the national budget. Critics have pointed out that the PISA results contradicted the government's insistence that Malaysia had a world class education system. Critics have also questioned the real worth of the Sijil Pelajaran Malaysia (SPM) which produces many students who scored As, but who can't compete with their peers from Singapore, China and Taiwan. Gil Sander said an efficient education system should be decentralised to give more power to schools to make their own decisions based on their local circumstances. "At the same time, parents should be provided with information on the performance of each school in their area so that they can send their children to the best schools," he said. On the other hand, Gil Sander claimed that Malaysia's rate of household debt is not nessarily bad, so long as the economy keeps growing and incomes keep rising. "Low levels of debt could be an indicator of no access to finance, but if a person borrows money to buy a car to go to a good job, that is not a bad thing. "The important thing is that salaries keep rising," he said. – March 25, 2014.